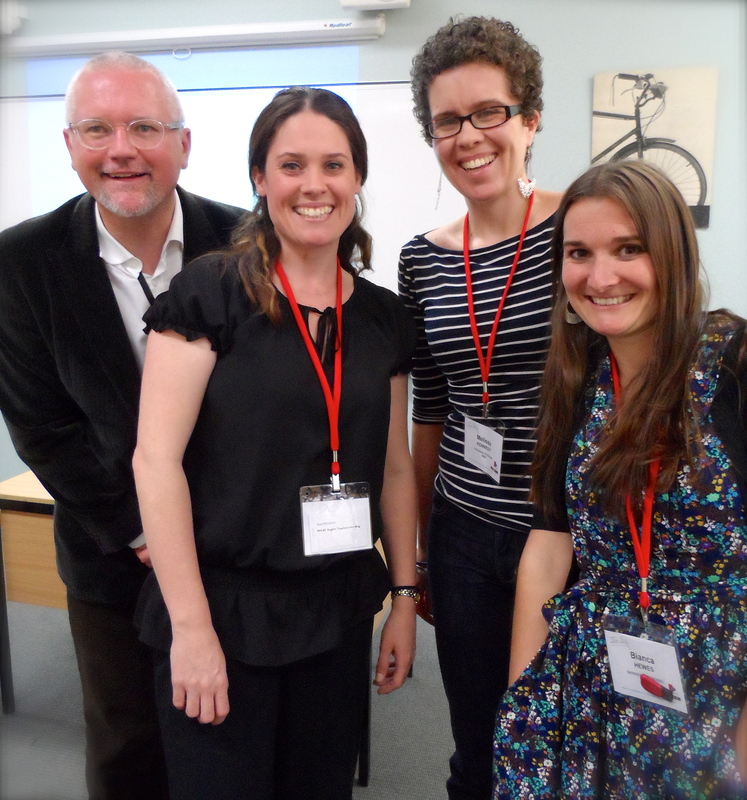 Last week I presented material on using PBL in English at the AATE national conference. PBL involves a process of deep learning over time. PBL must involve an authentic audience beyond the teacher. PBL still involves small bites of teacher-delivered material, timed to support learning and project progress. PBL involves students in tackling real world concerns. Relevance is key! Finally, I offered a range of my own ideas for PBL units for English. This frustrated non-teaching teacher would be very pleased to see others use/adapt/critique these project concepts…please report back if you do! I recently publicised a TeachMeet that my students and I were hosting at QUT as part of a unit on English Curriculum Studies. This particular TeachMeet had the theme ‘What works in education?’ and was designed to facilitate the kind of professional sharing that I want to model for my students – open, generous and friendly with a focus on developing relationships and building communities of practice. 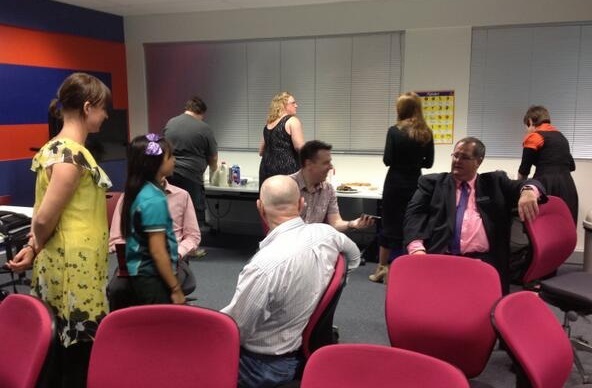 Reflecting on the event, I think the best part of a TeachMeet is the opportunity for face-to-face connection with other educators in a non-threatening environment. Although we also had a strong backchannel occurring in both Twitter and Scootle, it was the chance to ‘put a face to a name’ that I valued most. It was also awesome to see experienced educators modelling courageous sharing for my preservice teachers – everyone authentically attempted the ‘pecha kucha’ or ‘micropresentation’ styles, which are challenging to master! The next Brisbane TeachMeet will be held soon, on Thursday 24th October, at Marist Ashgrove. If you are an educator in SouthEast Queensland I encourage you to attend – you can sign up via the wiki. Last week I was walking a colleague through Twitter and thought now may be a good time to pen a post with some tips for new users. In particular I want to encourage new users in the education sector to build their profile on Twitter and explore its potential as a personal learning network. In just a couple of weeks from now our Queensland English and literacy teaching associations are co-hosting our annual national conference. We have set up a Twitter handle (@EngLit2013) and declared a hashtag (#BNW13) for the event. With luck this medium will take off during the event and lots of teachers will experiment with using Twitter, perhaps for the first time. This post, therefore, is written with school teachers and English/literacy educators in mind, as well as my colleagues at university. If you have joined Twitter but still don’t really know what to do with it, this post is for you! Many people I talk to feel nervous about writing their first tweet and following lots of people. So let’s not start there! The first thing I like to get people doing with Twitter is making their profile page inviting to potential followers. When you first create a profile on Twitter you will be given the default egg image as your picture. But you are not an egg! You aren’t even a chicken! You are a person! It’s very important to update your profile picture, or ‘hatch you egg’, to show others that you are active online. By adding an avatar that better represents you, the service will also start to seem more interesting to you. I rarely follow anyone who doesn’t have a bio, and many others have the same rule. Why? Not because I’m a Twitter-snob, but because without a bio it’s hard to tell who you freakin are! Some people are reluctant to add a bio, worried that it will reveal too much about them, breach their privacy, or make them identifiable to their employer. Don’t feel pressured to name your workplace. Terms like ‘maths teacher’ or ‘science educator’ give us enough information to go on. Avoid declaring your religious or political affiliations, unless you are very comfortable doing so. Get in the habit of only saying things online that you would proudly stand by if your employer saw it. Don’t include your location if you have concerns about privacy or safety. You can always add this in later, once you are comfortable. If in doubt, just browse a few other profiles until you get a feel for the kind of things people write. Many people are happy sharing that they are a husband, wife, parent of three, dog-lover etc. Writing such things is OK and entirely within the genre of a ‘professional’ bio. It’s all up to you and what you want to signal about yourself and your passions/priorities to others. I’ve heard a lot of recommendations about the ideal number of people to follow to get connections happening on Twitter. I suggest you will need to follow at least 50 people to see real ‘action’ on your feed…but following that many people is very overwhelming to most new users! If you don’t follow enough people though, it will be difficult to see the point of Twitter. So if you are a teacher trying to get the hang of microblogging I advise following about 15 other profiles straight away. This will give you enough material to read when you check Twitter that you are bound to find interesting things and start to see ‘the point’. If you are happy to follow celebrities there is also @MargaretAtwood, @stephenfry and @rickygervais. Sometimes they tweet A LOT though, so if that gets too intense, always feel free to UNFOLLOW people – we don’t take it personally on Twitter! This is actually the easiest part. You can choose to say something, ask a question, or share a link with others. 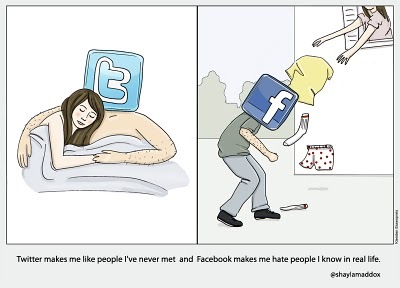 What you must keep in mind though is that Twitter is NOT Facebook. There are no ‘likes’ (though tweets can be re-tweeted or added to a favourites list) and many times you will say things that get no reply or comment. Not single one. Don’t be sad about this! Be confident in the knowledge that people may be reading your tweets, but not replying. You will do this to them too – it’s OK.
Also be confident that even if no-one notices your tweet, that what you wrote was still worth saying. You might even come back to your own tweets every now and then to rediscover links or information you have shared. Your Twitter feed is as much for you as it is for others. If you want lots of people to see your tweet you can include what is called a hashtag in your post – popular ones include #edchat and #edtech. There are also subject-specific hashtags, such as the #ozengchat tag for Australian English teachers to use for chatting. Once you’ve added a profile picture and a bio, followed some people and posted a tweet, you are well on your way to being an effective microblogger. Tweeting directly to people by including their handle (e.g. 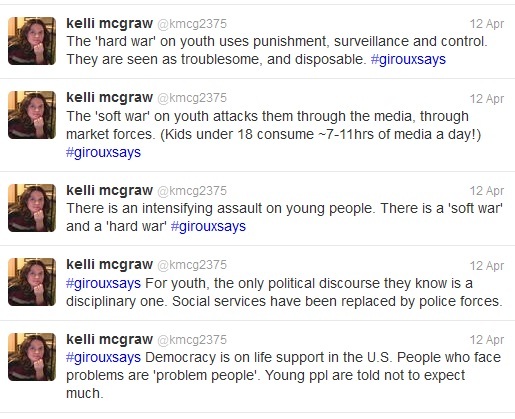 @kmcg2375) in your post and including hashtags can increase the number of replies you get, but you will find this out as you go. One final thought for those of you who are wary of joining ‘yet another’ social media service…not all social networks are the same. I’ve been back from overseas now for a few weeks and have almost (almost) accomplished the Great Assignment Marking Catchup. We’re all faced with one from time to time, but for me having a trip overseas is still always worth it! 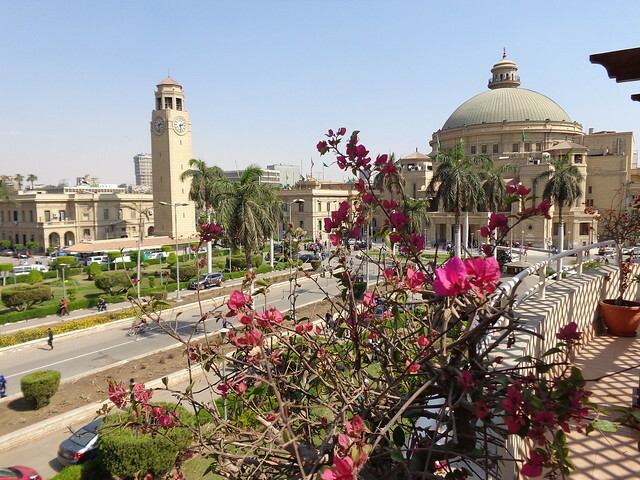 Part of my overseas stay was, amazingly, in Cairo. I had never been to Egypt before, or anywhere in the Arab region. Most of my time was spent at the MILID Week meetings at Cairo University, which was the event I was there to be part of. MILID stands for ‘Media and Information Literacy and Intercultural Dialogue‘. 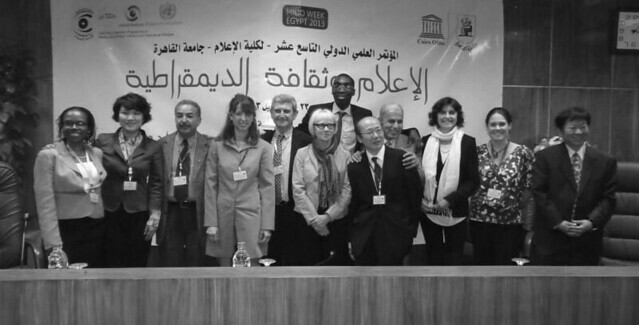 UNESCO, together with the United Nations Alliance of Civilisations (UNAOC) have created a UNITWIN Cooperation Program and Global Chair on ‘MILID’, to focus resources and efforts across partner universities from around the globe on Media and Information Literacy. Act as a Observatory for critically analyzing: the role of Media and Information Literacy (“MIL”) as a catalyst for civic participation, democracy and development; for the promotion of free, independent and pluralistic media; as well as MIL’s contribution to the prevention and resolution of conflicts and intercultural tensions and polarizations. How did I get involved? Across the globe there are eight universities involved as Chairs in the MILID program. My institution, Queensland University of Technology, is the Chair from Australia. Other countries represented are: Spain (Autonomous University of Barcelona), Egypt (Cairo University), China (Tsinghau University), USA (Temple University), Brazil (University of Sao Paulo), Jamaica (University of the West Indies), Morocco (Mohamed Ben Abdellah University). This semester QUT has run a pilot course in Media and Information Literacy and Intercultural Dialogue, using the UNESCO Curriculum for MIL. Along with Michael Dezuanni and Hilary Hughes, I’ve been teaching the course to students online, for free, from over 70 countries. 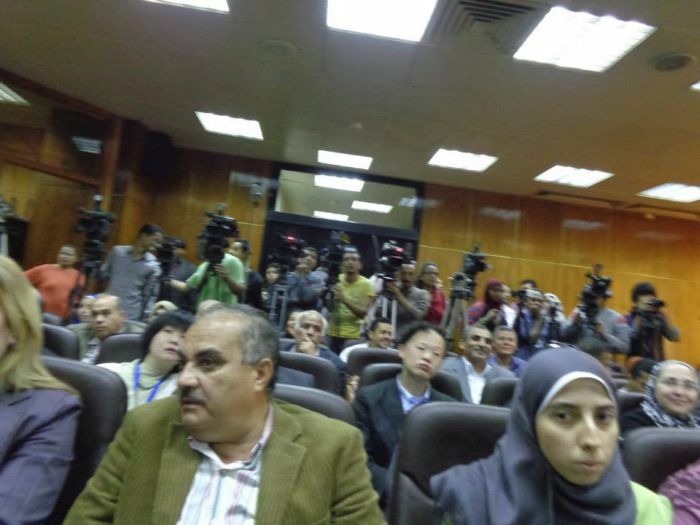 This year Cairo University was the host of MILID week, which ran from 22-25 April. Last year the week was hosted in Barcelona, Spain; next year the week will be hosted in Beijing, China. What I liked best about my first MILID week was the opportunity it provided to speak in depth with colleagues in this specialised field. Over the days of debates and presentations we shared information about how media is being used (and subverted) in our countries and regions, as well as the politics of information literacy in schools and communities. This event gave us space to find common interests and develop shared strategies for promoting the concept of MIL. It was eye opening to consider such questions during the MILID week as: How can we plan collaboration via social media in a group that includes members from China? How can we share media texts across national boundaries to promote intercultural dialogue? How can media and information literacy support social justice initiatives? Mostly I was interested to learn about how other universities worked and how much attention is given to media literacy and/or information literacy in different places. I came away with the impression that Australia is relatively well-placed in terms of access to traditional and new media, connection to the internet, and use of social media. But I wonder whether Australian students are exposed to practices of citizen journalism as much as they might be? It struck me that in a place like Egypt, citizens currently have a lot of motivation to produce their own stories and information…by contrast the culture of media consumption in Australia seemed complacent to me. And, as always when spending time with folks from a range of countries, I was reminded of how monolingual my world is. I speak next to no words in other languages; most of the people around me from Anglophone countries were in the same boat. If I can’t go in person to the MILID Week in China next year I’ll be disappointed now, as I feel like I only just got to know this group and my place in it! However with the week falling in April/May, right in the middle of semester 1 in most Australian universities, I can’t say I will be able to take this kind of a break away from classes again for awhile. Either way, I’ll be continuing to promote the new MILID journal and contribute online to the Clearinghouse. Soon the MIL Curriculum will be available via an interactive module-based website, to complement the existing PDF of the Curriculum. I’ll be sure to post again with details once the site is launched! Thanks to QUT Faculty of Education and UNESCO for supporting this travel and development opportunity. This is why more English teachers should write a blog! I’ve just come home from the AATE 2012 national conference in Sydney. It was exceptionally energising to spend two whole days and nights talking face-to-face with people in my PLN, as well as getting to know my colleagues better and meet new people. Andrew Burn outlined a ‘3Cs’ model of media literacy – Cultural, Critical, Creative. How does this differ to other models of literacy (e.g. Green’s 3D model, Luke & Freebody’s 4 Resources model)? Bianca’s presentation on Project Based Learning emphasised the role of assessment. I have also found this to be very important, have others? Gillian Whitlock from UQ presented some really interesting ideas about humanitarian perspectives on literature and children’s writing. She showed refugee writing from Australia and artwork that had been created to memorialise the refugee journey. Definitely someone in Queensland to talk to or hear from again! The hashtag #5bells was used pretty successfully as a conference backchannel, I thought! What can we learn from this and how can we improve the experience for 2013 in Brisbane? Vivian (@vivimat78) did us all a big favour by collecting many of the #5bells tweets via storify…this is super helpful and valued, as hashtags are no longer searchable, after a time period, and we don’t want to lose all that great sharing! Vivian also coordinates the #ozengchat twitter chat and edmodo group. What relationship might exist in the future between AATE and #ozengchat? How can/do they support each other? Hip Hop – OMG Adam Bradley was convincing. All the copies of his ‘anthology’ book sold out, and so many people left the keynote ready to exchange their cardigans for hoodies… In response I’ve started a Twitter list: trust-me-i-m-cool for teachers looking for Aussie Hip Hop links. One love! I found the closing keynote by Bill Green and Jane Mills to be quite problematic. I understand their point to be that linguistic frameworks have taken over the analysis of ‘the visual’, and that ‘cinephiles’ understand film in a much more ‘visceral’ way. I don’t agree. I think this contrast is weird, given the way I cry like a baby when reading some books, and (I believe) can successfully understand the moving image, thank-you-very-much. I usually love Bill’s stuff, but would rather have heard about his theories on ‘spatial literacy’ than be told English teachers are inadequate at teaching film…wrong crowd for that idea bill and jane, wrong crowd indeed. Don’t do it for me, do it for you! However, I really do believe in the power of reflective writing for learning, and I encourage any new blogger to write posts for themselves as much as for an imaginary audience. It’s OK to talk to yourself here! Think about it – how many times have you tried to convince a student to do a piece of reflective writing for homework, because you know the benefits it will have for their learning? Writing up your experiences on a blog can have the same benefit for you! The mere process of deciding “what will I publish information about this time?” will put you more in touch with the successes and obstacles in your practice, I really do believe this. So that’s the second big reason. Start a blog for yourself, because if you haven’t yet, then I think you need to. If you think you “can’t find time to write anything, ever”, then making time to do this will hopefully help you see ways to make time for other things too. And don’t worry – the blogging police aren’t going to arrest you if you don’t add anything for 3 months! 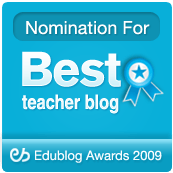 The third reason why more English teachers should start a blog is because teachers who blog and share their resources are usually friendly, generous and just plain fun to hang out with. This year in Sydney, as with last year in Melbourne, AATE and ALEA are holding separate national conferences. The ALEA National Conference, which is about to be held in Sydney from 6-9 July, has already sold out all available places (Well done to Lisa Kervin, the conference convenor!) I’ll be sticking my head in on the last day of this conference to hand out promotional material our conference in Brisbane…it’s hand over time, baby! The AATE National Conference will be held a little later this year, from 3-4 October. I’ll be there with Five Bells on, presenting a workshop with Bianca Hewes on ‘Success, obstacles and ethics in online teaching’ as well as on a panel about teacher blogging. I’ll be joined on the panel by the likes of Bianca, Troy and Darcy, so you know it’s going to be a power-session; not to be missed! Once these two conferences are wrapped up, it’s next stop: Brisbane 2013! …will I see you in Brisbane in 2013? …in his address at the launch of the Werklund Foundation Center for Youth Leadership Education in Calgary. Before coming to the 2012 AERA conference I had the absolute pleasure of attending the Inaugural International Youth Studies Congress at the University of Calgary. 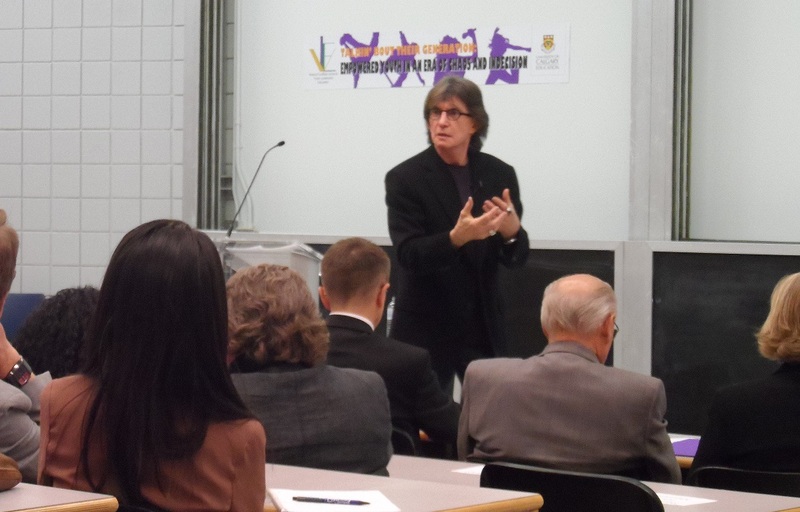 As well as hearing from distinguishes scholars, teachers and students on issues relating to youth studies, the major highlight for me (and tbh, the carrot that helped me decide to attend in the first place), was the keynote address by Henry Giroux. 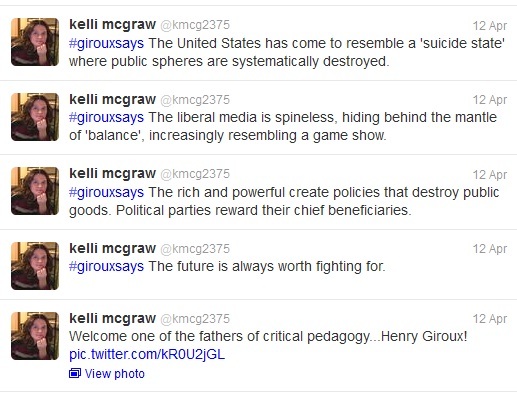 If you consider yourself a ‘radical’ educator and have not yet read Giroux’s work, I highly recommend it! He is doubly awesome in my book, given his commitment to getting his scholarly thoughts out into the wider-read public domain. I thought it very fitting, therefore, that I should tweet the ideas from his talk that stood out most for me. You can read the gist of his talk in this op-ed article: The ‘Suicidal State’ and the War on Youth. You are currently browsing the archives for the conferences category.